Dr. Recasens is a founder and Medical Director of Macular, Retinal, Vitreal Associates, which provides state-of-the-art Ophthalmology services to patients with diseases and conditions affecting the eye, including macular degeneration, diabetic retinopathy, flashes and floaters, retinal tears and detachments. 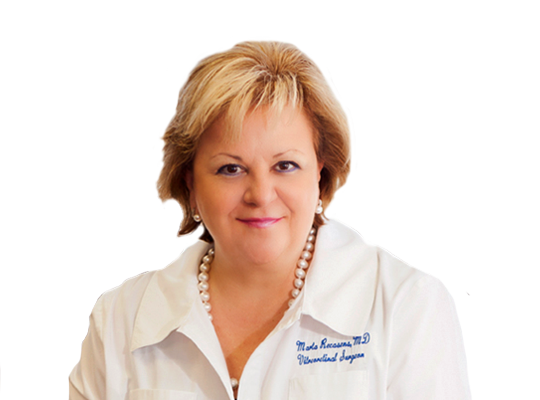 With over 9 years of private practice experience in Ophthalmology Retinal Diagnosis and Treatment, American Board of Ophthalmology Certified Dr. Marta Recasens provides comprehensive eye care within a compassionate, warm and trusting environment. Dr. Recasens specializes in Retinal care, including management of Macular, Retinal and Vitreal diseases and surgical procedures. Dr. Recasens, and her exemplary staff, are proud to offer the most advanced technology in Digital Photography, Digital Angiography, Optical Topography, Visual Field Testing, Ocular Ultrasonography, and Electronic Medical Records, as well as, the latest treatments for Macular Degeneration and other Macular Conditions, Retinal Tears, Diabetic Retinopathy, Retinal Detachments, and Vascular Occlusions. Among her many accolades, Dr. Recasens is a Diplomate of the American Board of Ophthalmology, a Fellow of the American Academy of Ophthalmology, and has been named among America's Top Ophthalmologists annually between 2002 to 2008. Dr. Recasens is committed to one-on-one, patient focused care for family members of all ages. Her dedication to the preservation and restoration of vision is second to none. Vision is a precious gift. Dr. Recasens is committed to helping her patients enjoy it. Dr. Recasens and her Spanish-speaking staff provide unmatched Ophthalmology services you, your family, friends and colleagues can trust for life. Same day or same week appointments are available without referrals for most plans. To learn more about Dr. Recasens, visit www.yourretinamd.com/ or call (866) 403-1893 to schedule a consultation. Are you a patient of Dr. Marta Recasens? Login to your Who Is Who account and share your experience with Dr. Marta Recasens. It takes seconds to register. Start your FREE account today and share your expereince with Dr. Marta Recasens.